Dental providers must determine the presence of orofacial injury, and diagnose and treat dental and orofacial outcomes of trauma caused by motor vehicle collisions. Determination of causation and relation to the trauma is indicated. Dental trauma includes concussion, subluxation and dislocation of teeth, and fracture of teeth and maxillofacial bone, in addition to soft tissue injury that may cause ecchymosis, hematoma and laceration or abrasion. This article focuses on orofacial injury and dental complaints following motor vehicle collisions, while part 2 focuses on temporomandibular symptoms. Motor vehicle collisions (MVCs) may result in orofacial trauma. In addition to undergoing medical evaluation and possible treatment, victims of MVCs should be investigated for possible dental, oral and jaw-related injuries. The history should include questions about any new symptom in the head, neck and dentition and the nature of the incident, including time, date, location and events leading to the MVC. The patient should be questioned about any direct impact (e.g., whether any portion of the head, face, jaws, mouth or teeth struck or was struck by any object), pain (severity and location) and dysfunction (e.g., difficulty opening the mouth, range of jaw movement, altered occlusion, noises in the temporomandibular joints [TMJs], difficulty speaking or chewing and mobile teeth), and numbness (of the lip or chin). These patients should be carefully examined extraorally and intraorally.1-3 If the history or examination suggests hard tissue (maxilla or mandible) involvement, appropriate diagnostic imaging should be obtained: screening pantomographic view, plain films, dental imaging, conventional or cone beam computed tomography (CT). Suspected soft tissue injuries may require magnetic resonance imaging that includes the TMJ area. Fractures of the mandible or maxilla are likely to be treated surgically shortly after the accident, involving open (with internal fixation) or closed reduction with or without intermaxillary fixation. In cases of condylar fractures, observation and physiotherapy might be deemed most appropriate.5-7 Lacerations in the intraoral and perioral areas are generally sutured early in the post-accident period. 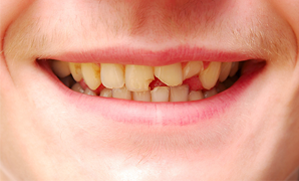 Uncomplicated crown fractures may involve enamel and dentin without pulp exposure. Pulp sensitivity may be negative initially indicating transient pulpal damage. Radiographs (90° horizontal angle through the damaged tooth, occlusal view, lateral view from the mesial or distal aspect of the tooth, or cone beam (CT) may be taken to rule out displacement or fracture of the root. Radiographs of lip or cheek lacerations may also be indicated to identify tooth fragments or foreign material. Available tooth fragments can be bonded to the tooth. Exposed dentin can be covered with glass ionomer or bonding and composite resin. If the coronal segment of the tooth is displaced, it should be repositioned as soon as possible and its position assessed radiographically. The tooth should be stabilized with a flexible splint for 4 weeks. If the root fracture is near the cervical area of the tooth, stabilization is beneficial for a longer period (up to 4 months). It is advisable to monitor healing for at least 1 year. Concussion is an injury to the tooth-supporting structures without abnormal loosening or displacement of the tooth, displaying a marked reaction to percussion (in a horizontal or vertical direction). There may be no bleeding from the gingiva. Pulp sensitivity tests are likely to be positive and no abnormalities are seen radiographically. No treatment is needed for these teeth, except for possible selective occlusal adjustment of the opposing teeth and follow-up. However, the pulpal condition should be monitored for at least 1 year (including at 4 weeks and 6–8 weeks). If clinical findings, including pulp sensitivity tests and radiographic examination, show no abnormalities, monitoring may be terminated at that time. Subluxation is an injury to the tooth-supporting structures with loosening, but not displacement of the tooth, and can cause sensitivity to percussion and occlusal forces. Bleeding from the gingival crevice may be noted. Pulp sensitivity may be negative initially, indicating transient pulpal damage; however, these teeth usually respond positively to sensitivity tests. Radiographic abnormalities are usually not found, although a slight widening of the periodontal ligament space may be seen in cases with marked mobility. Extrusive luxation occurs when a tooth is extruded apically from its socket with minimal damage to the socket wall. The tooth appears elongated and is mobile. Pulp sensitivity will likely be negative. Pulp revascularization may occur in mature teeth; it often occurs in teeth with open apices. Radiographs show an increased periodontal ligament space apically. A tooth exhibiting lateral luxation is displaced, usually in a palatal–lingual or labial direction, and is accompanied by fracture or comminution of the socket wall. The tooth will be immobile and percussion generally produces a high, metallic (ankylotic) sound. Pulp sensitivity tests will likely produce negative results. Pulpal revascularization usually occurs in immature teeth. The periodontal ligament space is widened and best visualized on eccentric or occlusal exposures or cone beam CT imaging. Intrusive luxation is likely to result in pulpal necrosis and root resorption, depending on the extent of intrusion. Intruded teeth are not mobile; percussion may produce a high, metallic sound and pulp sensitivity tests are likely to be negative. On radiographs, the periodontal ligament space may be absent from all or part of the root. For teeth with complete root formation, the tooth should be repositioned either orthodontically or surgically as soon as possible. In immature teeth, pulpal revascularization may occur. For teeth with incomplete root formation, spontaneous repositioning should be allowed to take place. However, if no movement is noted in 3 weeks, rapid orthodontic repositioning or surgical repositioning might be necessary in some cases. The pulp will likely be necrotic and endodontic treatment using a temporary filling with calcium hydroxide is recommended to retain the tooth. Splinting for 4 weeks has been suggested for some cases. Pulp necrosis is usually diagnosed within 6 months, but may develop years later in open-apex teeth.9,10 Progressive root resorption occurs in nearly 50% of cases. Teeth should be followed clinically and radiographically at 2 weeks, 6–8 weeks, 6 months, 1 year and then yearly for 5 years. Almost all surviving intruded immature teeth undergo pulpal calcification. An adverse outcome is common following intrusive luxation. Avulsion is a broad topic and beyond the scope of this article. Excellent reviews have been published elsewhere.9,14,17 However, several factors can influence the approach to avulsed teeth, including whether the tooth has a closed or open (1 mm or more) apex, whether it has been replanted, whether it has been kept in special storage media and whether the extraoral dry time is less than or longer than 60 minutes, as the critical limit for dry time is reported to be no more than 20 minutes.17 Guidelines for the management of avulsed teeth are presented in Boxes 1–3. Click on the boxes to view larger versions. Head and neck pain and temporomandibular disorders following an MVC could be referred to dental practitioners. These injuries are discussed in part 2 of this article. Dr. Epstein is professor and head, department of oral medicine and diagnostic sciences, University of Illinois at Chicago, College of Dentistry; director, Interdisciplinary Program in Oral Cancer, College of Medicine, Chicago Cancer Center, Chicago, Illinois. Dr. Klasser is assistant professor, University of Illinois at Chicago, College of Dentistry, department of oral medicine and diagnostic sciences, Chicago, Illinois. Dr. Kolbinson is professor, College of Dentistry, University of Saskatchewan. Saskatoon, Saskatchewan. Dr. Mehta is clinical instructor, orofacial pain clinic, University of British Columbia, Vancouver, British Columbia. Dr. Johnson is associate professor and director of postdoctoral endodontics, department of endodontics, University of Illinois at Chicago, Chicago, Illinois. Ceallaigh PO, Ekanaykaee K, Beirne CJ, Patton DW. Diagnosis and management of common maxillofacial injuries in the emergency department. Part 5: Dentoalveolar injuries. Emerg Med J. 2007;24(6):429-30. Lynham AJ, Hirst JP, Cosson JA, Chapman PJ, McEniery P. Emergency department management of maxillofacial trauma. Emerg Med Australas. 2004;16(1):7-12. Elias H, Baur DA. Management of trauma to supporting dental structures. Dent Clin North Am. 2009;53(4):675-89. Subramanian K, Chogle SM. Medical and orofacial considerations in traumatic dental injuries. Dent Clin North Am. 2009;53(4):617-26. Andreasen JO, Storgard Jensen S, Kofod T, Schwartz O, Hillerup S. Open or closed repositioning of mandibular fractures: is there a difference in healing outcome? A systematic review. Dent Traumatol. 2008;24(1):17-21. Nussbaum ML, Laskin DM, Best AM. Closed versus open reduction of mandibular condylar fractures in adults: a meta-analysis. J Oral Maxillofac Surg. 2008;66(6):1087-92. Stacey DH, Doyle JF, Mount DL, Snyder MC, Gutowski KA. Management of mandible fractures. Plast Reconstr Surg. 2006;117(3):48e-60e. Flores MT, Andersson L, Andreasen JO, Bakland LK, Malmgren B, Barnett F, et al. Guidelines for the management of traumatic dental injuries. II. Avulsion of permanent teeth. Dent Traumatol. 2007;23(3):130-6. Moule AJ, Moule CA. Minor traumatic injuries to the permanent dentition. Dent Clin North Am. 2009;53(4):639-59. Flores MT, Andersson L, Andreasen JO, Bakland LK, Malmgren B, Barnett F, et al. Guidelines for the management of traumatic dental injuries. I. Fractures and luxations of permanent teeth. Dent Traumatol. 2007;23(2):66-71. Accorinte ML, Loguercio AD, Reis A, Carneiro E, Grande RH, Murata SS, et al. Response of human dental pulp capped with MTA and calcium hydroxide powder. Oper Dent. 2008;33(5):488-95. Dammaschke T, Wolff P, Sagheri D, Stratmann U, Schafer E. Mineral trioxide aggregate for direct pulp capping: a histologic comparison with calcium hydroxide in rat molars. Quintessence Int. 2010;41(2):e20-30. Bornstein MM, Wolner-Hanssen AB, Sendi P, von Arx T. Comparison of intraoral radiography and limited cone beam computed tomography for the assessment of root-fractured permanent teeth. Dent Traumatol. 2009;25(6):571-7. Epub 2009 Oct 14. Flores MT, Malmgren B, Andersson L, Andreasen JO, Bakland LK, Barnett F, et al. Guidelines for the management of traumatic dental injuries. III. Primary teeth. Dent Traumatol. 2007;23(4):196-202. Andreasen FM, Pedersen BV. Prognosis of luxated permanent teeth—the development of pulp necrosis. Endod Dent Traumatol. 1985;1(6):207-20. Andreasen JO, Andreasen FM, Andersson L. Textbook and color atlas of traumatic injuries to the teeth. Hoboken (NJ): Blackwell Munksgaard; 2007. McIntyre JD, Lee JY, Trope M, Vann WF Jr. Permanent tooth replantation following avulsion: using a decision tree to achieve the best outcome. Pediatr Dent. 2009;31(2):137-44. Hinckfuss SE, Messer LB. An evidence-based assessment of the clinical guidelines for replanted avulsed teeth. Part II: prescription of systemic antibiotics. Dent Traumatol. 2009;25(2):158-64. Hinckfuss SE, Messer LB. An evidence-based assessment of the clinical guidelines for replanted avulsed teeth. Part I: Timing of pulp extirpation. Dent Traumatol. 2009;25(1):32-42. Okeson JP, Falace DA. Nonodontogenic toothache. Dent Clin North Am. 1997;41(2):367-83. Hung T, Thomas R. Facial paralysis after a road traffic accident. J R Soc Med. 1998;91(6):322-3.